Cars swerving to miss potholes, bumper-to-bumper congestion, concrete falling from dangerous bridges and a lack of enhanced safety features such as broad shoulders along roadways create hazards for Michigan drivers. 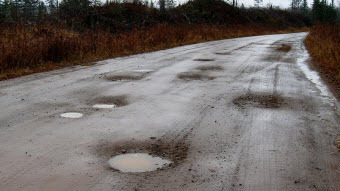 Michigan roads are notoriously known as some of the worst in the nation. A recent trucker survey ranked Michigan second-worst behind only Pennsylvania. And a 2009 study by the Pacific Institute for Research and Evaluation concluded that Michigan loses $383 million per year in vehicle accident costs where road conditions contributed to crash frequency or severity. In addition to safety concerns and accident costs, there are economic consequences that Michigan is suffering from as well due to poor roadways. Manufacturing, tourism and agriculture form the backbone of the state’s economy. These job providers rely on the state’s transportation system to safely and efficiently get their products to market. Unfortunately, they are less competitive when vehicles get stuck in traffic or get beat up by the constant wear-and-tear imposed by rough roads. Our out-of-state guests often experience less than “Pure Michigan” when they drive their cars or RVs on poorly maintained thoroughfares leading to key travel destinations. But, there are significant cost savings if we choose to manage our assets effectively. Allowing our roads to fall apart means that taxpayers are forced to pay for costly reconstruction projects. It’s been estimated that the public pays four to six times the cost by doing the elaborate reconstruction projects, as opposed to smaller, ongoing inexpensive repairs. There’s an old adage that says, “you’re going to pay for good roads whether you have them or not." We can do better in Michigan. A recent study by the conservative Anderson Economic Group says that if policy-makers do nothing to address our rapidly deteriorating infrastructure, it will cost our state 12,000 jobs. It is estimated that Michigan already has 32,000 miles of poor roads and more than 3,000 poor bridges. But, the report also notes that a bold plan of action to reconstruct our state’s transportation infrastructure would create an additional 15,000 jobs -- even with an increased user fee to pay for it -- because of the economic benefits associated with sound infrastructure. Gov. Rick Snyder should be commended for his October infrastructure message and his proposal to fix the state’s ailing transportation network. His plan includes doing away with the state’s 19-cent gas tax and replacing it with a tax on “Big Oil” based on the wholesale price of fuel. The tax change would place a disincentive on fuel companies from raising prices, while being revenue-neutral based on current prices. Because today’s road maintenance dollars are based largely off of how much fuel is consumed, as vehicles become more fuel efficient, the ability to pay for road improvements decline rapidly. The Michigan Legislature has not adjusted the gas tax to keep up with inflation, increasing fuel taxes only once in 27 years. Making this transition away from a per-gallon gas tax, as Snyder proposes, will allow the state to keep up with maintaining our roads while no longer suffering from years of legislative inaction and neglect. The Snyder plan also suggests a $10 a month increase in vehicle registration fees as a way to dig our state out of the hole that we are in. This modest increase would mean the average Michigan driver would pay approximately $40 per month to have full access to more than 120,000 miles of roadway -- far less than consumers pay for a monthly cell phone or cable TV bill. This money would allow the state to pave an additional 1,300 lane miles each year and reconstruct 400 bridges. While, the Snyder plan will not serve to solve all of our traveling ills, it would go a long way to put us on the road to recovery. We, as citizens, need to encourage and support our state elected leaders to make the right move and address this situation by finding ways to increase investment in our transportation network. By laying the foundation, we can turn around Michigan’s economy, create good-paying jobs and make Michigan great again! Mr. Jacobs is right about the need for this investment. It MUST, however, also include a major component for mass transit, to help our cities become the kind of places young talent -- who are voting with their feet for cities who let them get around without the high cost of auto ownership -- or it will have failed to make the real transition our state needs. It's also worth noting that a vehicle registration fee is, once again, a regressive tax, forcing poor people, who drive less than the wealthy, to shoulder a higher piece of the burden than those of us who put more miles on the highways. RAISE THE GAS TAX now. It's simple. Its the better choice for new revenues. And the industry needs to become serious with its political donations and refuse to contribute to individuals and caucuses who are NOT supporting this vital reinvestment in Michigan. Agreed! Remember roads are made out of oil and light rail is not. Michigan should be a premier green technology state that manufactures and uses a variety of green technologies. Michigan is putting good money after bad because winters and heavy trucks will destroy them in a few more years. They will then need repair when oil is even more expensive. What we need is a progressive income tax that doesn't keep clobbering the working poor and middle-class with fees. The license fee is a regressive tax that hurts lower-income families the most. How about raising the license fee based on the fuel efficiency and year of a vehicle rather than its weight? Newer vehicles with poor fuel efficiency will be charged the most. Why should those of us that chose to live in the suburbs and own a car subsidize the urban worker so he does not need to drive to work? The fact that he/she choses riding public transportation in leiu of driving his/her car to work saves him/her a substantial amout of money. Let him/her pay 80% of driving his/her car to work to support public transportation. If public transportation with the federal subsidy can't support itself then it needs to go away. Vehicle registration or gas tax is regressive. Many lower income folks are forced to live in rural settings in order to find affordable housing and then must commute farther distances to work. Paying a fee based on mileage driven is the only fair way to pay for roads and the sooner people get over the fear that big brother wants to track your whereabouts, the better it will be for equidible cost sharing for road maintenance. The side bennefits are reduction in stolen vehicles (lower insurance costs), better road route, signal and parking planning, up to date traffic counts for better utalization of existing capacity, better detour routing and timing when/if roads need to be closed for maintenance and it can use the existing credit card infrastructure to impliment. We are not getting our moneys worth in road building. Why are we building concrete roads and freeways without foundations? Sand is not a foundation. The Romans knew how to make better roads than we do. If we had the climate and soil conditions they have in Rome, our roads would last forever. Pavement sections can be designed to last longer but, as engineers are trained to do, we design the most economic section as possible based on cost over life span. Many factors do play into the economic analysis but a lot of it is based on assumtions. Because it is difficult to predict what costs will be in 20 to 40 years for fuel, labor and materials, the replacement cost is our best approximation at the time of design. Michigan roads are plagued in many areas by high ground water and soils of lower bearing capacity. Poor drainage is the number one cause of pavement deterioration in Michigan. Saturated subgrade and our winter freeze thaw cycles destroy even the best constructed pavements prematurely but the cost of drainage infra-structure and the lack of suitable outlets for a drainage collection system make any consideration more expensive than re-constucting the road every 20 years. Maybe it is time to look at the problem in a different way. I wonder if anyone has what all those states that have better roads are doing differently. I wonder if it the initial construction that sets up these road failures. I wonder if is time to ask those who use the roads what they think should be done. I wonder if it is time to consider closing roads or a least control traffic on them, for the longest time it had to do with the weigh of the vehicles. If that is the case I wonder if setting up a load limit route selection process, something where a vehicle operator could, using their GPS, let the state provide a routing plan. I wonder why the first answer to everything in our state is spend more money and never about seeking new approaches. I wonder if Mr. Jacob has turned to anyone outside of his sphere of thinking (such as the politicians) and ask those innovative companies, such as those making chemicals if they have every consider looking at additives for the concrete and asphalt that make the roads more stable. I wonder if there is some additive at a $1 a foot could extend the life of a road another year or two, would it be worth it. It is always impressive how all jobs are create and maintained, but we never hear about what they are. Is it the road crews that maintain roads. I wonder how many jobs would be lost if the roads last a year or two more, does that ever enter in to the consideration by those thinking like Mr. Jacob. But I am only one of those who needs his taxes raised to satisfy Mr. Jacob's yearning for more roads like the ones we have now that need to be repaired. We need to raised the gas tax. Raising the registration fee is not the way to go. The elderly person that drives 100 miles per month will be paying would be paying the same as the person that drives 1000 miles per month. That does not seem fair. I thought governor Snyder was for a fair tax system. Raising the registration fee is not fair. I own two cars, a '94 and a '98, neither new. I pay about 90.00 per vehicle for tabs each year. You are asking me to pay 240.00 more per year to repair roads that I do not damage. Big heavy trucks are the culprits that cause damage to the roadways. Remember all the garbage trucks from Toronto coming to the cheaper Michigan dumps: they caused significant damage. Tourists and hunters use our roads and bridges:let them help in maintaining our roads by raising the gasoline and DIESEL taxes.A per gallon tax increase more closely matches the miles driven and the "damages" done by drivers. Raising registration fees is another hoax perpetrated by a governer out of touch with the common man's life experiences and expenses. We are not all millionaires like Snyder, the DeVoses and other folks eager to spend somebody else's money . Raise gas and diesel taxes now, hire thousands to fix the roads and bridges.Don't raise the registration fees which are already high.Not all of us spend 10.00 per month at Starbucks, as Snyder had suggested. How self-serving, to have the president of a paving company to offer suggestions on road repair that raise registration fees. Talk about the fox guarding the henhouse! John is just the messenger. His company is going to make money either way. He is just pointing out that we can address the problem to preserve the infrastructure we have today or completely rebuild the system in the future at triple the cost. The road system is no different than any other system. You can change the oil in your car on a regular basis or let it go untill you have to replace the engine. Right now funding is at 1998 levels and prices of diesel fuel, bituminous asphalt and salt are 200 to 300% of what they were in '98. Local road agencies are doing everything they can to try and maintain a service level acceptable to the motoring public. This probably hides the real impact the loss of funding is having on our infrastructure. If you want to see what's going on with the road system in Michigan follow this link http://www.mcgi.state.mi.us/MITRP/document.aspx?id=487 to the 2010 annual report from the Transportation Asset Management Council. This just reflects our Federal Aid roads, not primary and local roads that more deteriorated. The good thing about the governors suggestion is that it gets people thinking and giving there opinion. It is through dialog like this that makes for better decision makeing. At least I feel we are moving forward in our State.